Gender Economics is a term that I am using to describe the economics of gender, or economies built around gender consumption – it is a sub set of Integrity Management Methodology because it relates to culture and social responsibility. This is a new field but it is an important aspect of our social and business climate today and certainly very important as we move into the future. With the number of economic collapses mounting (Greece, Ireland to name a couple), we need to be aware of all our available resources and methods to build stable economies, and stable and sustainable businesses. In the gender economy, we have reduced portions of the population to merely passive consumers, making indirect economic input rather than direct input. Stabilising the balance between indirect and direct impact has a role developing our economic future. In less enlightened times and still in some cultures today, preference is given to male born children. Whilst the thinking around why this happens may be complex, at a base level, male children were seen as more productive than females. For cultures that depend on agriculture or manual labour, a strong male child is seen as an asset that will directly and positively affect financial outcomes for families and communities. However, a female may be seen as dependent, and not valued in terms of her contribution, and so she is given little input to decision making. In modern advertising, gender is often targeted and an example is the car industry, previously a male dominated industry with cars designed by men primarily for men. This industry has come to recognise that the bulk of all new car purchases were largely influenced by, if not decided by, women. This has lead to a change in focus by car manufacturers with offerings like designer styles, practicality and family friendly advertisements. In this case, women have moved from being seen as indirect decision makers through simple consumption, to direct decision makers who therefore directly impact the economy of the car manufacturing industry. 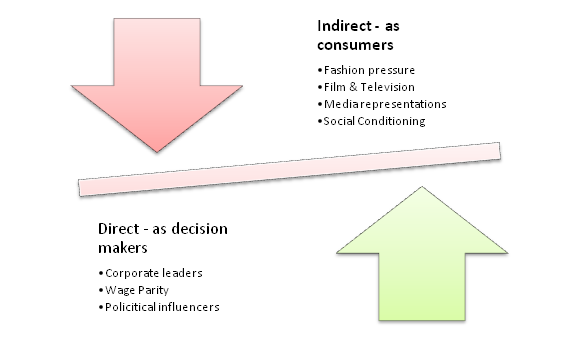 Currently, most women are seen as consumers, with only an indirect impact on the economy. The Gender Economy is about recognising this and devising ways to shift the impact to a more Direct impact on the economy.